I recently had a chance to catch up with Zia Priven, a very talented and passionate design duo in New York creating glamorous lighting to die for. With so many decor8 readers writing in to voice an interest in swapping careers to pursue something creative, this interview is for you. Zia Priven, a husband and wife team based in NYC, are transplants from LA with a background in the film industry. What turned them on to lighting design? How did they get started? Where do they find inspiration? Peek in on my chat with Marcia to find out. Enjoy! decor8: So nice to finally have a chance to catch up with you Marcia, I know that the past few months have been very busy at Zia Priven, especially with the ICFF. For decor8 readers who aren't familiar with your work, please tell us about Zia Priven? 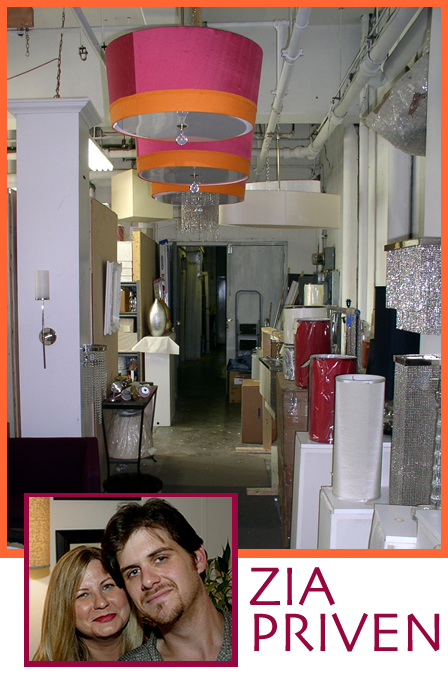 marcia: Zia-Priven Design is the custom lighting company my husband Paul and I founded in 1999. We design and manufacture our own lines for both the trade (residential, commercial and hospitality) and retail markets and really try to have fun with it. We love experimenting with unusual materials like slinky ball chains or beautiful wallpapers, while at the same time are very concerned about attention to detail. We think that?s what makes our pieces special; we tend to obsess over the details. decor8: Can you take a moment to boast a bit about the pieces that you're most proud of? marcia: Ooooh, we hate to boast. But if we must... Most recently it?s been the Troy Chandelier?both the crystal and ping pong ball version of it (yes, ping pong balls). We did a huge 10 foot tall piece for a recent show and it came out exactly how we planned it. Okay, it took almost 9 months to make, but it was definitely worth it! Others we like are the Monaco Chandelier and Sconce?we love everything with the ball chain, and pushing the envelope by experimenting with new and different materials keeps things interesting. 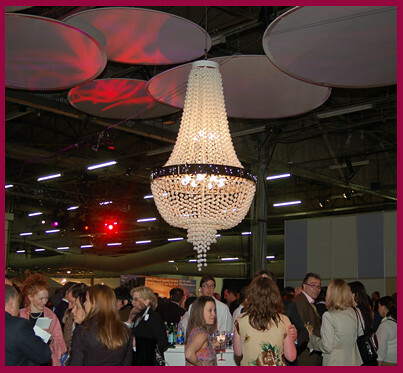 We love the Waterfall Chandelier too?it?s the one with the crystals that cascade down through the center of the shade. This has been one of, if not the most popular piece we?ve ever made. It?s so hard to narrow it down. decor8: Do you have a particular theme that you work with? marcia: Our work is often called glamorous or Hollywood Regency, but I think it covers a larger spectrum than that. Much of our influences do come from old Hollywood films and those grand old neighborhoods that 60?s Hollywood Regency comes from?we grew up around them. decor8: What are the main characteristics of your work and your work method? marcia: Though some pieces we make may seem over the top, I would say refinement and quality are the two words that best characterize our pieces. When designing, I always ask myself ?is it something I would buy?? and ?what element could I take out to make it better?? decor8: What are your backgrounds... Anything you think would be of particular interest to decor8 readers? marcia: Well, I think what?s interesting about us and hopefully inspirational to others is that we come from a completely different background, and going into this we knew absolutely nothing about lighting except that we were both strangely drawn to it! Paul and I were in the film business, living in Los Angeles where we both grew up, and actually met while working on a film. As a matter of fact, it was one of Terrance Howard?s first films, and we?re so proud of how far he?s come. Paul was the Assistant Director and I was the Production Designer and we got along rather well, still do, I should say! We became inseparable after the film ended and we both felt a similar dissatisfaction with what we were doing. We yearned for more creative control and something we could really call our own, but weren?t really sure what to do. I think this a common feeling out there. Choosing to leave our established careers for something fairly unknown was one of the scariest but most fulfilling decisions we have ever made. You gotta follow your heart. decor8: How did you get involved in lighting? marcia: When Paul and I left our jobs, we decided to open a home furnishings store, mixing the best of new and old pieces together. I have a great fondness for antiques of all eras and learned a great deal when I worked at an antique auction gallery in my 20?s. We would comb every flea market and yard sale for that great find, and when we finally opened our store we noticed that the majority of it was lighting! It seems we were drawn to chandeliers and lamps and sconces, while there was barely any furniture. Furniture was heavy, but lighting was exciting and made such a statement in a room. 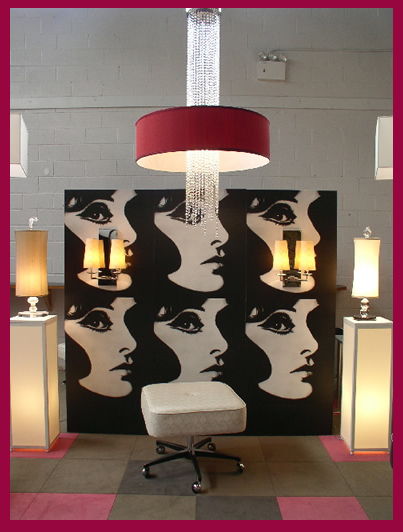 We quickly became known for our great selection of unusal vintage lighting. Back then we would take an old chandelier, paint it, change the crystal design, add some funky shades and suddenly a vintage piece was contemporary, it was pure fun. One thing I hung onto from those days is a wonderful collection of vintage black crystal that?s just waiting for the perfect chandelier. marcia: That was pretty much how we learned the ins and outs of lighting. We had to clean, rewire and fully restore every piece, research what it was, how old it was...We wanted to be the best so we knew education was the key. We put every dime we had, as well as borrowing some, into this business. When you have so much at risk, you give it your all. There is nothing like fear to drive you! One day we decided that constantly looking for the next great find was getting to be too time consuming and besides, we had a notebook full of ideas we wanted to bring to fruition. It would be so much more interesting to simply design and make our own pieces. We actually looked at each other and said, ?why don?t we just make one of these?? Yeah, what an understatement, but that moment was the catalyst to creating our own designs. decor8: At that point, how long did it take you to launch your collection? marcia: It took us several years before we introduced our first collection. Once that started to take off, we decided to take it all the way?we got married and moved to New York to live out another dream. Our honeymoon consisted of us driving a moving truck across the country. It wasn?t exactly Paris, but it was thrilling. decor8: I think that's even more thrilling, you were embarking on a major adventure together - a life changing one. Anyone can lay on a beach for 2 weeks or dine on the shores of the Left Bank, but a cross country relocation, now that's romantic. About your company name, I'm curious, how did the name Zia Priven come about? decor8: I agree, good choice. What is your design philosophy? marcia: To us, good design evokes emotion, be it serenity or passion. Design should be functional yet adventurous, excite your soul but not take itself too seriously. decor8: So true. Marcia, Zia Priven is known for quality, can you tell us about the materials you use? marcia: Of course. When we began our company we knew we were getting into a race we knew little about. Instead of trying to cut corners to compete with imports, we chose to make the best quality fixtures we could possibly make. For our to-the-trade line, we use the most amazing metalworker in all of New York, his craftsmanship is exquisite. We import our crystal from Czechoslovakia and Italy, instead of China, for its quality and clarity. We care greatly about every detail. For our Wallpaper Collection, we import rolls of the finest hand painted and blocked papers from Cole and Son in London as well as a great company in New Orleans, called Flavor Paper. These papers are not inexpensive, the quality shows, and you just can?t get that anywhere. Even our lamp and pendant shades are made from the same company that makes all of Boyd Lighting?s shades. We go out of our way to give our customers the best piece they will ever buy and do whatever we can to keep the prices as reasonable as possible. decor8: I love Flavor Paper, I wrote about them not to long ago. Oh, I almost forgot to ask, how does your work reflect your personality? marcia: When I was a little girl, I used to love watching those great, old, black and white movies?the sets were spectacular. Those sets inspired me to become a set decorator. I wondered why life that was lived with such style and on such a grand had seemed to disappear. So, I guess I wanted to bring some of that stylish elegance back, but make it contemporary and livable for today. decor8: Like every interview I conduct, I'm always dying to learn about the actual design studio - where ideas transform into objects, the birth of beautiful things. Can you tell us about your design studio? marcia: Sure. Our studio is split up into an office, showroom and work space. Paul works each day in the studio in Brooklyn with the rest of our great team and I work from our home office here in the Upper West Side. Because I handle more of the design side of the company and Paul handles the business side, I prefer the quiet. I just can?t concentrate when the phones are ringing and lamp parts are clanging. decor8: Makes perfect sense. Can you point to any designers, friends, mentors who have helped you or shaped your ideas along the way? marcia: We are big fans of Tommi Parzinger, TH Robsjohn Gibbings, Jean-Michel Frank, and currently Kelly Wearstler, Betsy Burnham and Barbara Barry. decor8: With so much success, there had to be hurdles that you've faced. Tell us, what issues do you find that seem to pop up the most in your business? marcia: Finding quality suppliers and surprisingly, growth. As the company begins to grow, you have to think about so many new things such as hiring additional employees, do we have enough space, are we reaching all our customers? decor8: Let's talk about inspiration for a moment. Often, it's the little things we find that no one else takes interest in that inspires us the most. A pinecone, a shell, a spool of vintage thread in gorgeous peacock blue. What inspires you? marcia: We find inspiration all over. I love design magazines and pour through them whenever I can. I collect objects I find interesting on a little shelf above my desk. Currently, there?s a really cool vintage knocker, an oval piece of white marble and the most incredible hollow Italian crystal I have ever seen, it?s almost 18 inches long. decor8: Inspiration breathes life into your soul so one can create, but motivation and determination, staying on course no matter what, is key. Why motivates you to keep going? marcia: Once we finalize a piece we have to move onto another, it?s almost like a treasure hunt. The excitement of making something new keeps us going. We can?t sit still or our heads will explode. decor8: I heard that you have some things brewing... Can you share with us what's next in world of Zia Priven - what are you working on now? marcia: In August, we are launching a new retail line at the August NY Gift Fair which includes several new table lamps and a re-introduction of the hanging pendant lamps that originally got our name out there. What?s exciting for August is that we will have the pendants in stock (in certain sizes and colors), enabling us to reduce the cost to our customers, and almost eliminate the lead time. Custom pieces are still the majority of our business, but there has been such a demand for the pendants that we decided to make the leap into stocking them. 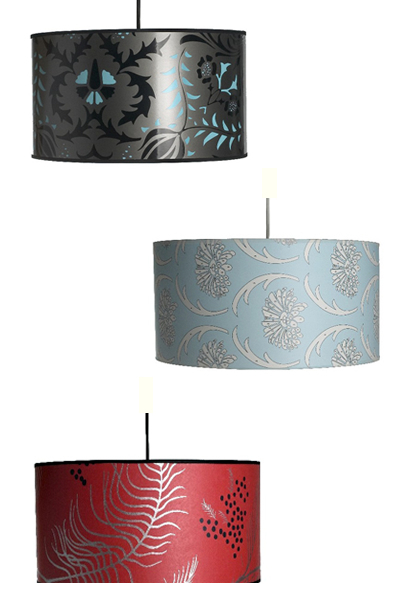 We?ll also have a lot of the table lamps available in a much short time. So this is the near future. We also design for several other lighting companies including Stonegate Designs and Robert Abbey Inc. which is a lot of fun. decor8: Where do you see yourself in say, 5 years from now? marcia: 5 years, though it?s shorter than it seems, is a long way off, but we plan to be designing more lighting for other companies in addition to Stonegate and Robert Abbey, expanding extensively on both our trade and retail lines, and developing, and either producing or licensing, a line of accessories and furniture. decor8: Exciting stuff! I know you were just at the ICFF and that you'll also be at the Gift Show this summer, do you participate in other shows throughout the year, and if so, which ones? marcia: Besides ICFF and The NY Gift Fair twice a year, we do the Architectural Digest Home Design Show, Brooklyn Designs, and lots of different design show houses throughout the year for charity. decor8: You've mentioned already that your studio is in Brooklyn, but you live in Manhattan. What do you like about living in NYC? marcia: We lived in Park Slope, Brooklyn for 2 years when we first moved from CA. We liked it there but since we came all the way across the country, we wanted to experience Manhattan?the City. We live on the Upper West Side which is more of a family oriented neighborhood. We wanted to be near Central Park and it?s just down the street and we love it. marcia: Hmmm....Saturday. We love sleeping in, having a late breakfast and then going for a walk through the park. On an early summer day, when it?s not too hot, but everything is green and blooming around you, we?ll listen to a musician playing the sax under one of the beautiful bridges, people watch, take in some street performers singing. Then we usually make our way to one of the city?s great flea markets, where the hunt is on for something amazing and unexpected. Finish the day with a nice dinner nearby, accompanied by a good bottle of wine and some live jazz. decor8: What are some of your favorite magazines and blogs? marcia: I love Interior Design, Elle D?cor, Metropolitan Home and Wallpaper for magazines. As for blogs, I only read a few religiously and those are decor8, of course, and AT-NY and AT-LA. decor8: Ah, nice. Next! If money were no obstacle, where would you live and why? marcia: I think I would have to own several homes. One on the coast of Italy, one in Paris, one in Martha?s Vineyard and one in a beach town in California. We love the ocean and we love the culture and history of Europe. Money is no object, right? decor8: Great answer. I've never had anyone mention more than one location, and you're right, money is no object. Oh, to live in the perfect world... And finally Marcia, what are the 10 things that you just can't live without? marcia: My husband (I had to include him), the perfect ocean view, Aretha Franklin, L?Occitane hand lotion, fresh flowers, Diet Rite, an ice cold Mojito on a hot day, barbequing with friends, good jazz and passion for what we do. Thank you so much for stopping in to share with us your past, present, and future. We wish you lots of success as you roll out your new collection in August, please keep us in mind when you have product shots so decor8 readers are kept in the know. Marcia, it's been a pleasure. Thank you again. You can purchase Zia Priven pendant and table lamps online at Velocity Art + Design, or you can contact Zia Priven directly at 718.398.6777 if you are interested in obtaining more information.